With flu season at its peak right now in Georgia, many school officials are encouraging parents to keep their children home when sickness strikes to avoid infecting others. Millions of Americans get colds every year. According to the Centers for Disease Control (CDC), the average American gets between 2 and 3 colds every year. While colds are a nuisance, the flu is a much more serious. According to the CDC, millions of people contract the flu virus every year. Hundreds of thousands contract the flu serious enough to require hospitalization. And, every year, tens of thousands of people die from the flu. Fortunately, there are some simple, common sense steps you can take to keep your family safe and healthy. When your mom told you to wash your hands several times a day, she was right. Dr. Mark Mengel, head of family medicine at Saint Louis University School of Medicine, explains washing your hands, especially after you’ve shaken hands with someone, ensures you dilute any germs you’ve picked up. Germs get on your hands quickly, but they get into your system through your nose and eyes. Most people touch their faces hundreds of times every day so that’s a lot of opportunities for cold and flu germs to enter your body. Make an effort to keep your hands off your face. It’s always important to get at least 8 hours of quality sleep every night, but it’s even more important during flu season. When you’re tired, your immune system can be compromised, increasing the chances you’ll pick up a bug. According to Dr. Mengel, you should try to get 8 to 10 hours of sleep every night during cold and flu season. A flu shot is your best protection against getting sick. It’s important to get your flu shot as early as possible during flu season, not only to protect yourself from early outbreaks, but also because shortages sometime occur. Make a commitment to get your shot as early as possible. The height of the flu season is from November to March, but check with your doctor to determine the most opportune time to get your flu shot. Eat a lot of fresh fruits and leafy, green vegetables. Eating healthy foods is proven to build up your immune system. Make a habit of eating plenty of fruits and vegetables and other healthy foods always, but especially during cold and flu season. Ann Kulze, MD and founder of Dr. Ann Wellness, agrees that a regular exercise routine, preferably at least half an hour a day, will boost your resistance and enhance your immune response. Steer clear of people with symptoms. The quickest way to pick up a cold or the flu is through direct contact with someone who’s already sick. Cold and flu germs are carried through the air when someone coughs or sneezes. Unfortunately, this means you have to keep a distance from coworkers, classmates, friends, and family members who display cold or flu symptoms. Alcohol-based hand wipes and sanitizing gels kill germs so use them liberally, especially when you’re in situations that doesn't allow you to wash your hands. Quick tip: Make sure the wipes you buy are alcohol-based; otherwise, they might not work. Drinking tea, preferably green tea, with honey and lemon is a good preventative measure. The steam activates the cilia that line the nasal passages, making them more effective at guarding against germs. Honey acts as an antibacterial agent and lemon thins mucus. Cold and flu germs can attach to foods and utensils. You shouldn’t drink from the same cup without first washing it, or even share a potato chip dip with others during the cold season. 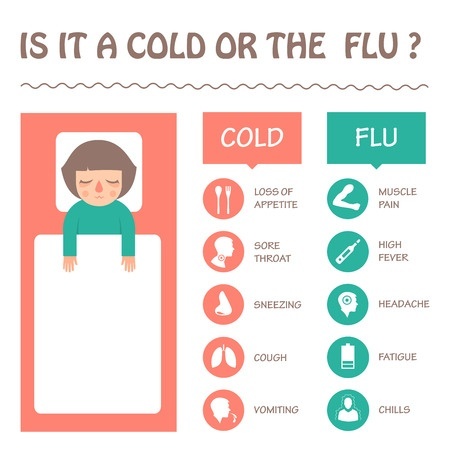 Catching a cold or the flu can cost you time off from work, or your children missed days at school, not to mention the physical discomfort you experience while you’re sick. It can also land you in the hospital if you don’t take smart, preventative action. Keep yourself and your children safe by using your common sense, staying away from cold and flu germs, and people who are symptomatic. Get your flu shot, eat well, and get plenty of sleep to stay healthy.